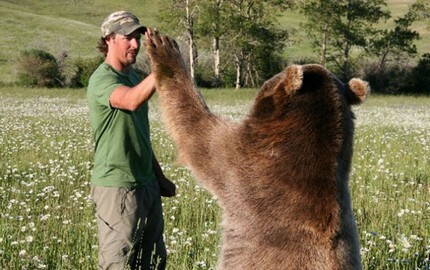 I by no means advocate people having grizzly bears as pets. In fact, that’s the very mess we are cleaning up with our rescue mission. No one should ever approach a bear whether it’s captive or wild. Two of the bears at our sanctuary are the result of people hoping to make “pets” of grizzlies and realizing after 18 years of living in small cages and being neglected, it was a bad idea. The responsibility of giving a bear a good captive life costs millions of dollars and is a lifelong commitment. My relationship with Brutus is extremely unique. It comes from years of experience and training. And Brutus is an exceptional bear. Brutus’ life is about 90 percent bear. He runs, swims, and digs with the other bears in the sanctuary. But Brutus loves the 10 percent human part of his life also. We don’t make him do it, he wants to. It’s his extracurricular activity, and he enjoys the stimulus. It’s not only our responsibility to keep him physically healthy, but mentally healthy, and this includes his human activities. He gets excited when we pull his trailer up. He knows he is going somewhere and that he is going to have an unique experience that will leave him stimulated and fulfilled. Together with his excitement and my passion for education, we touch the world and form a bridge between wild things and man. Through this bond, it is my hope that someday, there will be no captive grizzly bears, and that there will be a healthy population in the wild where they belong. 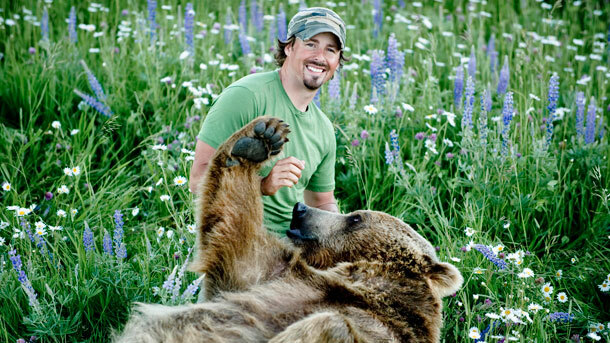 Nicknamed the “animal magnet” as a kid, Casey Anderson grew up in Montana surrounded by wilderness and animals. After college, he became an animal keeper and trainer at wildlife parks, traveling to elephant orphanages in Kenya, hanging out with crocodiles and even getting thrashed by a mountain lion. Then baby Brutus came into his life. Brutus was born in an overpopulated wildlife park. Casey rescued him from being euthanized and built a new sanctuary just for Brutus. A natural performer, Brutus was comfortable around people, making him a perfect assistant to teach park visitors about grizzly anatomy and conservation — and starring in educational videos and even feature films and television shows. Together they have worked on feature films, television shows, and commercials. 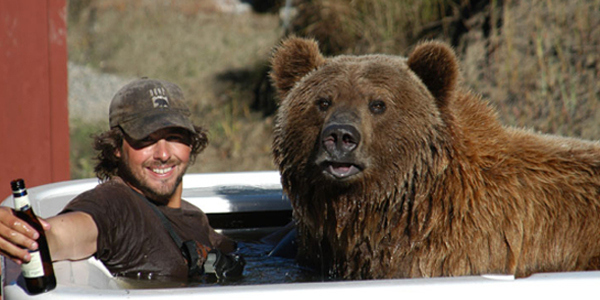 When they are not on set they spend their days at Montana Grizzly Encounter, a bear rescue and education facility that Casey founded in 2004, located in Bozeman, Montana. Whether they are educating the public on grizzly conservation, wrestling in the grass, or on a location, this tandem loves what they do.